An artist's illustration of the European Space Agency's Philae lander (left) after being released from its Rosetta spacecraft mothership on Nov. 12, 2014 to begin a seven-hour descent to the surface of Comet 67P/Churyumov-Gerasimenko. It is the first time such a soft-landing on a comet has ever been attempted. The first-ever attempt to make a soft landing on a comet is now underway. 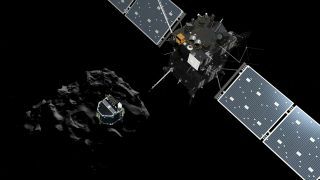 If all went according to plan, the European Space Agency's Philae lander separated from its Rosetta spacecraft mothership at 3:35 a.m. EST (0935 GMT) Wednesday (Nov. 12), beginning a long, slow journey to the surface of Comet 67P/Churyumov-Gerasimenko.You can watch the historic comet landing live on Space.com, courtesy of the European Space Agency (ESA). Scientists celebrate in a European Space Agency control room when they get the word that the Philae lander has successfully separated from the Rosetta spacecraft and is on its way down to the surface of a comet. The plan calls for Philae to be released just 14 miles (22.5 km) from the comet's center, but the 220-pound (100 kilograms) lander will take about seven hours to spiral down to 67P's craggy, boulder-strewn surface, finally getting there around 11:00 a.m. EST (1600 GMT) on Wednesday. The 2.5-mile-wide (4 km) comet's gravity field is extremely weak, so Philae will secure itself to 67P's frigid surface with harpoons. Mission controllers ran into a problem while getting Philae ready for landing. Scientists discovered that a thruster that would have been used to aid in Philae's landing could not be turned on. The $1.3 billion Rosetta mission blasted off in March 2004 and finally caught up with Comet 67P this past August after a decade-long chase through deep space. On Aug. 6, Rosetta became the first spacecraft ever to enter orbit around a comet. ESA officials hope Philae makes some more history Wednesday morning. While NASA's Deep Impact mission slammed a probe into Comet Tempel 1 in 2005, no spacecraft has ever touched down softly on one of these icy objects. But all will not be lost if Philae's landing attempt fails, ESA officials say; after all, Rosetta is scheduled to continue orbiting and studying Comet 67P through at least December 2015, four months after the body's closest approach to the sun. Observations made by Philae and Rosetta should help researchers learn more about comet composition and behavior, mission officials say. This information, in turn, should shed light on the conditions present when Earth and other planets were taking shape, since comets are relatively pristine remnants left over from the solar system's formation about 4.6 billion years ago. Comet 67P/Churyumov-Gerasimenko, which was discovered in 1969, has a strange, two-lobed shape that makes it look like a rubber ducky bath toy from some angles. The comet completes one lap around the sun every 6.5 years.